Here’s a break down of Cong. Joy Berno’s project from 2010-2013 uploaded by a FaceBook user. Interesting though the original PDF file that was uploaded was created/authored by a wife of a recently re-elected Politician who is also a partymate of the Congresswoman. The facebook user is using an alias. I don’t know but are there friction going on between these allies? are they starting to position themselves in 2016? Who knows. In any case, this is supposed to be public record so let’s go back to the report. According to the files, Cong. Bernos has allocated different project in Abra. 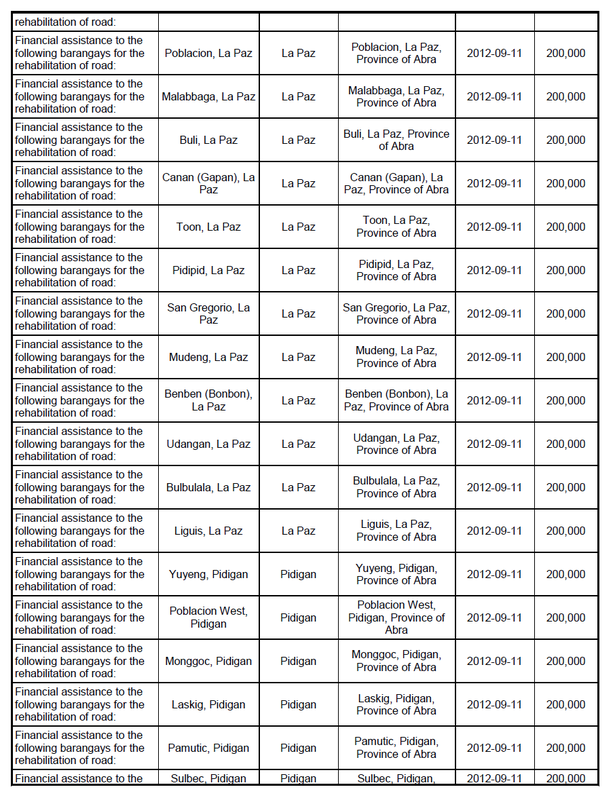 From a mere P12,000,000.00 in 2010, to a whooping P61,850,000.00 in 2011, P76,700,000.00 in 2012 and P30,000,050.00 in just the half of 2013. 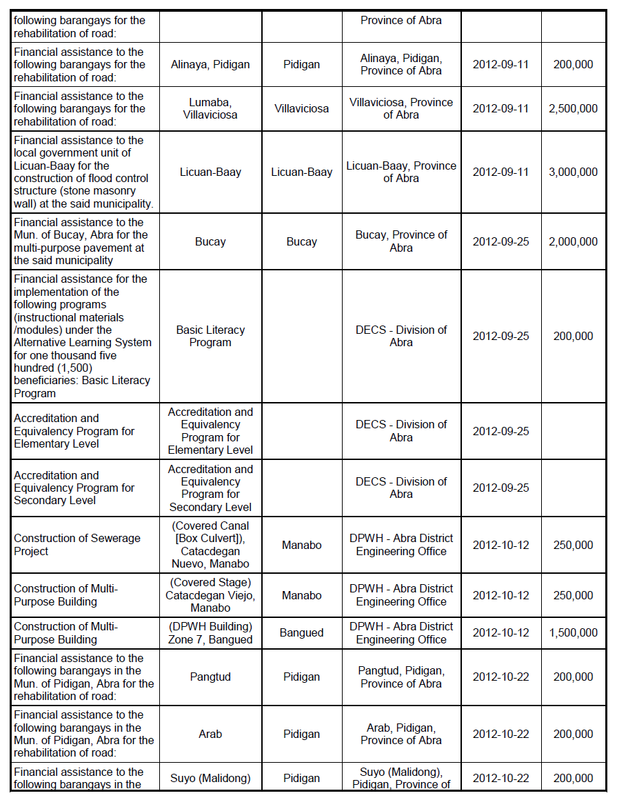 There are several projects with no cost like the funds she gave to the PNP Abra (3 months before the elections). Interesting breakdown of expenditures. Ket Dino met deta wife nga deta apo Sysop? Kadua da di napalabas nga election? Haan pay nangrugi tay next term da agsisina dan? Ay ket no kasta a ket election campaign nga three years ti pagdas-aran na toy panagakem dan! Awan man nga pulosen dyo! I think it was posted in response to a post from abrenian..com that I shared in facebook..
the post I shared was by “Andy” on May 19th @10:13 pm…please refer to “Results of Abra Election 2013”. I think “the alias “Roberta Bulda” is Willy Estrada. They keep calling him Willy Estrada whenever they post a comment to his postings. I maybe wrong, but why are they mentioning his name whenever they post their comments under his postings? I had been observing all of his postings…..Basaenyo amin Sysop nga postings na ket kasla ta kunak, they always mention his name. I maybe wrong but that is just my observation. nia’t conection na dtoy topic tay ta bulda kada estrada? umayos ka nga po! Nagiparwar kayo Apo ti listaan ti prad-projects nga nagapuanan ni Cong Joy gapu ta nangabak. Ket ni ngay met Apo Takit ? Ayanna ngarud met diay listaan ti gapuanan na? Fair is fair, a met, di kadi? Agpada da a koma met nga mapalakpakan ta s’yempre pareho da met nga adda accomplishments na. Ket agparis da koma met a nga masirig ta agkadua da met nga nangabak. Bakt, magkano rin ba yong nagastos na budget ng ospital ni Gob Takit? 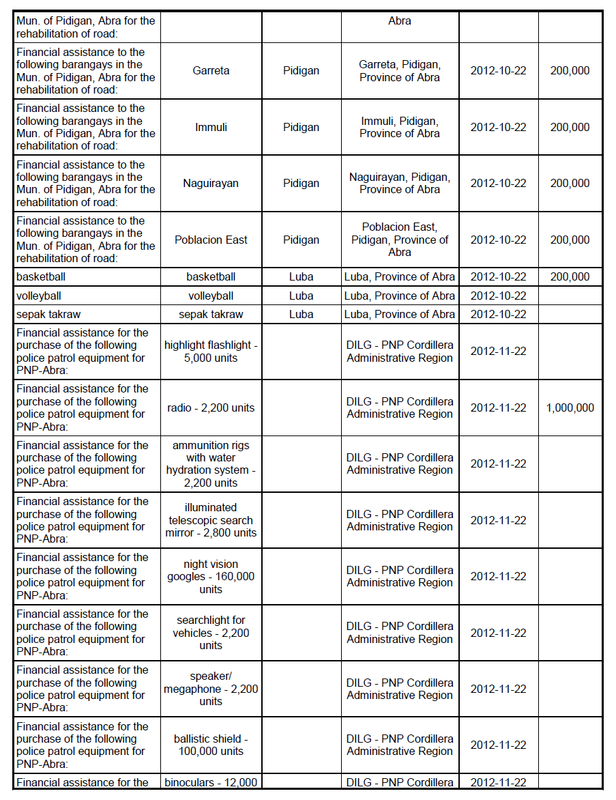 Adda pay daydiay 1,100,000 – financial assistance to Phil. 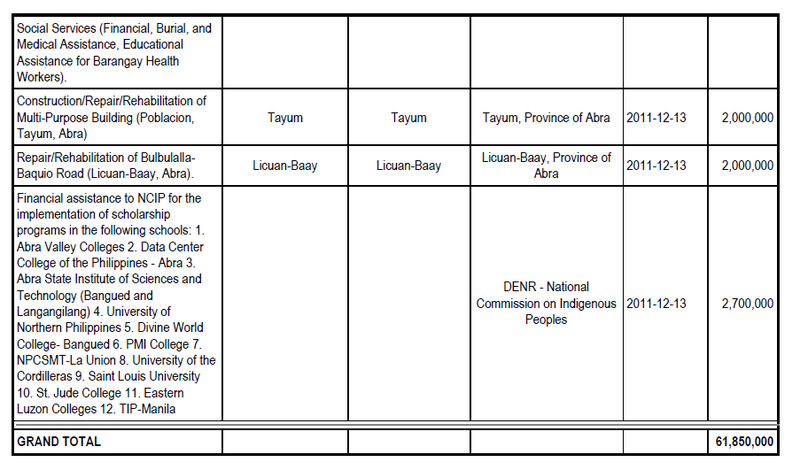 health Corp for implementation of national heath insurance for abra? Ania nga kaso daytoy -donasyon nga pribado wenno pautang nga maisublinto? 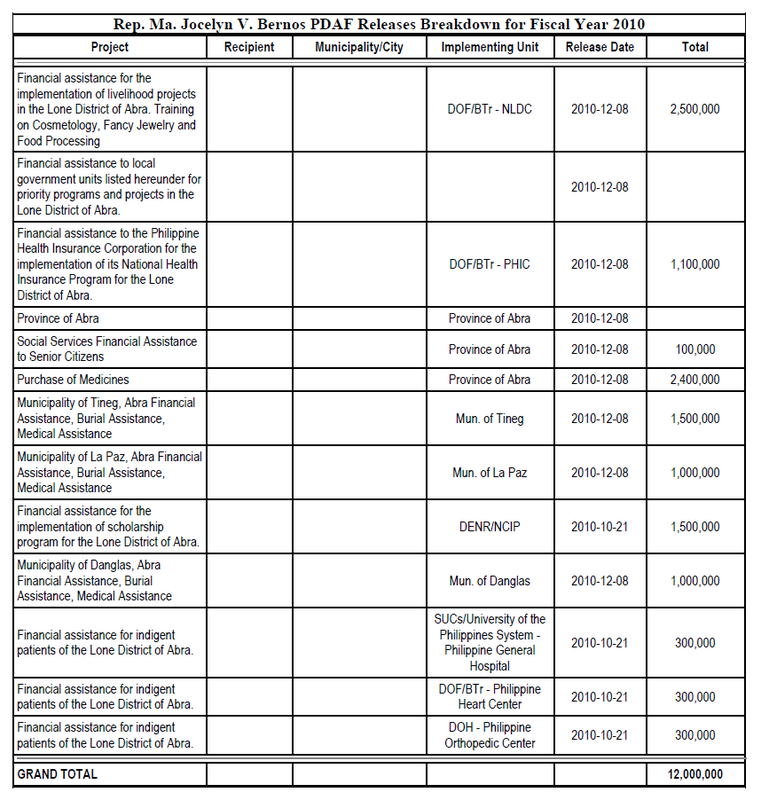 Kasano ti pannakausar daydiay 1,100,000 nga ‘financial assistance? 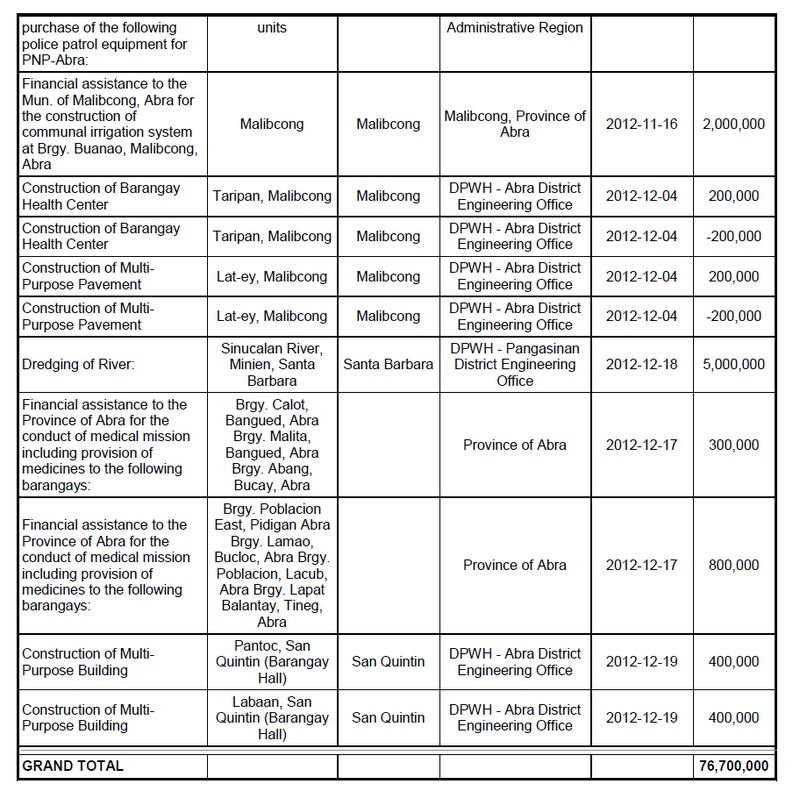 Purchase of medicines in the amount of 2.4 million for the ‘province of Abra’. What were these medicines? For whom? How were these medicines given to recipients? Ania nga klase dayta sakit nga nakaipapanan ti 2.4. 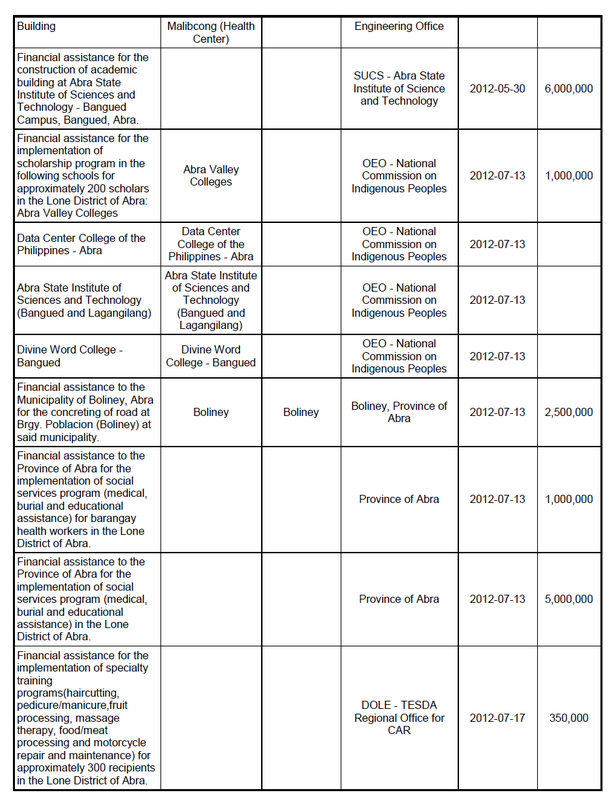 1.5 million as financial assistance for implementation of scholarship program? What kind of sholarship? Who were the scholars. How did the money defrayed? The amount is too ridiculously high for the purpose it’s claimed to be for. Public information daytoy Apo, ket the figures do not make sense. They do not add-up. Social services for burial, medical assistance, educational assistance for the indigents in the amount of 5 million? And…and there is no breakdown? Oh my Jesus- Far Out!?!?!?!! And then another 1 million was fused to the initial amount of 5,000!!! A total of 6million was released for what ?!?!?!! ay sus apo kakaasi kami met piman nga taga pilar maymaysa met ti naiparabor toy lugar mi, iti nabayag nga tiempo nga panag takem yo apo bernos? Iso dayta djay kunada nga iyunam nga subalitan/paburan dagiti tao/lugar nga naka tulong kenka iso nga bassit o naudi t pilar! tama ka bro. sinno dominating jay pilar? ni cong joy? SAAN! roger give me any email ad so i can send it to u thr breakdown of this, nakapoy tay nag post daytoy ta apay nga djay lng sumary na in post na in post na koma amin pati pictures na! Roger 2.5M for cosmetic training, food processing, jewelry training while also includes driving, mechanic even butchery training etc., is an individual training for those interested people for the whole abra with an applicants of 20,000-30,000 whole year round, this was entrusted by Department Of Finance, Bureau of TReasury to NLDC (tesda) thru PDAF (Abra Representative). While the 150k o 250k deepwell project goes to 1 barangay or 1 deepwell unit in a barangay or sitio depending if that area is highland (mountain part) or low land (sea level areas). 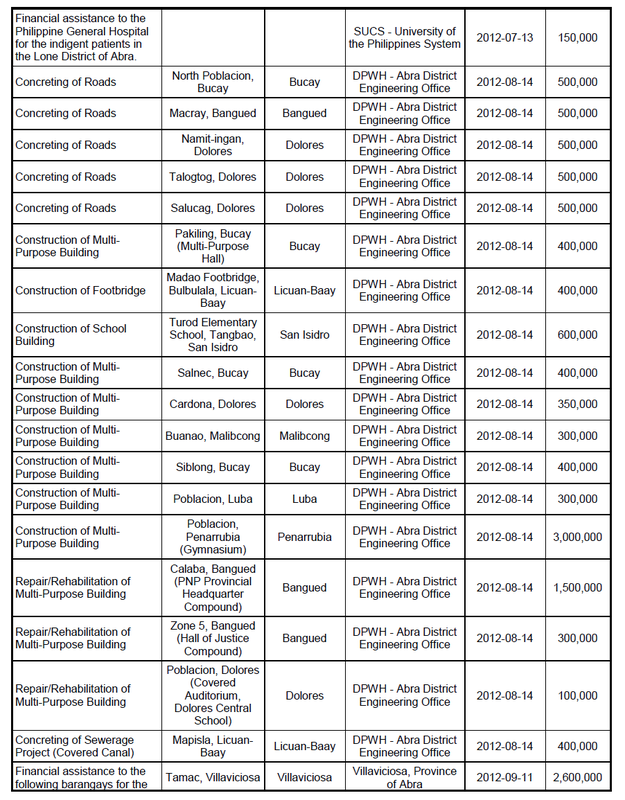 This deepwell project passes to DPWH which gone thru a bidding, materials testing and inspection by the Engineers n COA before it releases payment thereof! What should be bad is vice versa when appropriating an 2.5M for just 1 unit of deepwell and 150k for training 20,000-30,000 individual applicants for training for the whole year! On the other hand the 2.4M medicines, these refers to the free medicines to all whose in need with reseta from a doctor of course given by cong joy in her office at the capitol building FREE 24/7 (omg, if u dont know this or not even heard about it – maybe ur not in abra roger kasi lng nandon ka dapat alam mo yan). Anyway as long as i know ur email il send the pictures and other details! Goodday! Austin, apay nga ni Roger laeng met to omailam ket adu kami met nga mayat nga mapakaaamuan no Sinno Ti napariburan ni Cong Joy? Apay adda sidadaan nga ag-agas diay office ni Cong nga Mabalin nga maited no adda mapan dumawat Ti tulong? Apay nga diay opisina na Ti psngalaan da haan kuma nga neutral area tapno haan nga isingir ni Cong nga utang nga nakem total haan na met nga pirak???!!! Ken maysa pay panay nga La Paz, Danglas Ti makita nga naparaburan kasatno met dagitay dadduma nga munisipyon? 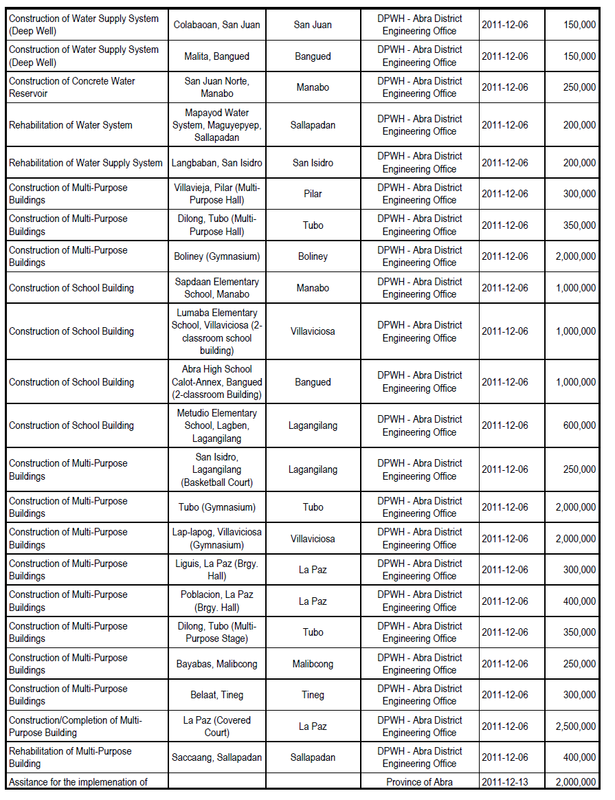 dagitoy multi-purpose building project nga worth 1.5M to 2M gymnasium agpayso met laeng dagitoy nga naaramid? kasla kuma gymnasium diay Tubo, Lacub, Daguioman, Sallapadan, Boliney, Baay-Licuan. Jay, inka la Kitaem mismon ta sigurado nga no sumungbat Ti pro-Joy nalpas kunada no anti-Joy awan kunada met. No agnaed Ka Ti maysa kadagitay nadakamat siguraduak nga maibagam no husto Ti adda ta papel Wenno haan! What’s to justify a 2.5 million training of 20,000 to 30,000 or more people apart from scribbling it on paper indicating that it was an implemented 2.5 million project ? Cosmetology, fancy jewelry crafting, food processing? Have you got your priorities right? 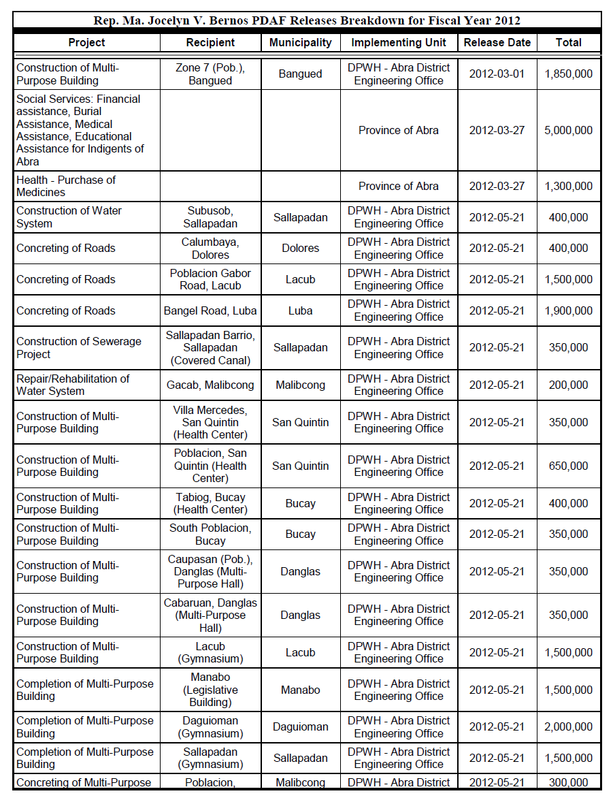 Was there any follow-through program nga naipakat so that the ‘skills’ worth 2.5 million that were imparted were employable and the money that should have been better off spent on more vital needs (ex: sewage, public toilets and proper maintenance, etc) could not just be written off as wastage? Were there beauty parlours, beauty salons, jewelry shops that came up? The last time i was in Abra, did i see coiffed hair, prettified painted faces, blings-blings? To both questions, the answer is: NADA! Because such are the last things that people from low to no-income brackets, not to mention – indigents, would think of! And if your intention was to provide skill for the unskilled to use for prospective employment anywhere, or maybe as OFWs overseas, then all the worse you got your priorities wrong! You want to encourage people on entrepreneurship? So skill them up in APPROPRIATE INDUSTRY SKILLS and then guide them through to use those skills to be beneficial to the province! Huwag bitawan basta pagkatapos mabigyan ng cerificate of completion sa training. I am not finished. I’ll be back. And Austin, you do not need to email me. Put out whatever you want me to read right here because i am sure as hell that others are interested to know more about how those monies for the province were juggled and spent. They sure want to know why Cong Joy would need an original Hermes bag anyway when she would release a 2.5 million budget for FANCY JEWELRY training! Our good Congresswoman has been quite a Godmother – with a sweet soft spot for the makikired nga protectors of her territory- the PNP. Please excuse my ignorance on codicils regarding pork barrel allocation (money from Congress) and explain how it works why equipment and the various logistics need of the PNP should eat away from the budget intended for provincial infrastructures use? 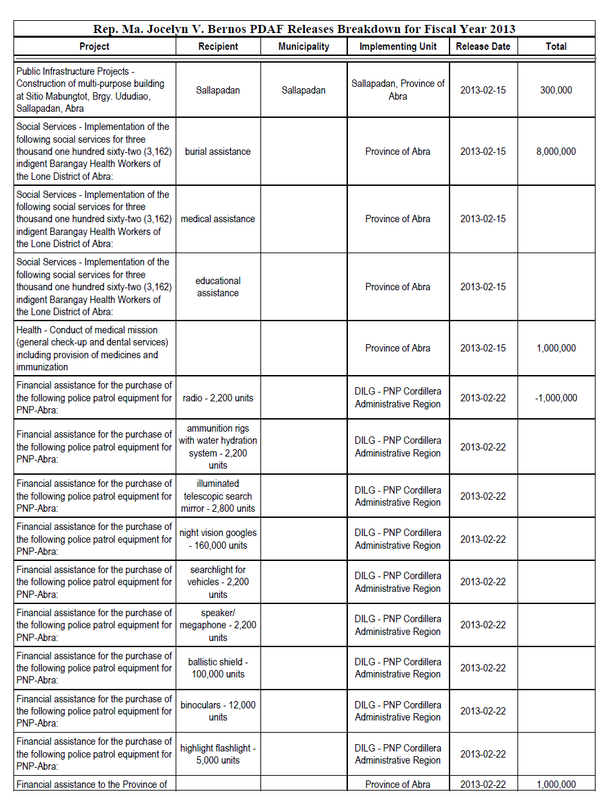 Isn’t there a national budget allocated for PNP and the monies are systematically funneled through that department? Logistically, aren’t the utilities and equipment supplied from the national headquarters? Were the monies mentioned as having been released to the PNP as equipment costs payment of services rendered in actuality rather than for utilities? if so, shouldn’t they be classified for accounting purposes as ‘other expenses’? Just asking … the list is too vague for my little brain, perdone me compadres! Wen ngarud, naglaka ti agaramid ti inu-ulbod nga “report”. natalo lang kasi chicken niyo! MILLIONS… MILLIONS… MILLIONS… but still ABRA is one of the poorest province here in the Philippines.. You know what, Politicians use those money for their own good and “LUHO”.. Let’s just say that some of them are engage in business but the mere fact that most of the people or the Abrenios doesn’t see the fruit of those MILLIONS.. com’n.. you may win BUT can you take it that you just win because the people is AFRAID of you, that you win because of MONEY, that you win because you said it so and if they won’t follow what you want they will suffer… I won’t consider it as a VICTORY because if you have a heart and a strong principle, you should be FAIR.. FIGHT FAIRLY..
Pinagbalin ni pasado gov. Priso daytoy RA 7171 nga RA 7 awan awan nga bimmaknangan ti adu nga mamayores nga awan puso ken riknada na manggungundaway ken pobrenga mannalon ti Abra. Inggana ita kakabsat kasla 7 awan, awan latta daytoy. Kakabsat Roger Macaraeg, River Cross and etc, please search on the website mentioned and help people of Abra know more about RA . Actually I have the feeling that money used in vote buying came from this source. Again, please search and have more details about RA717, our way of helping Abra. anyone can put anything on a piece of paper and claim that those ‘alleged’ projects are well completed thus lending some legitimacy. ngem no binsabinsaen tayo dagiti nakalista nga proyekto, awan kakabsat, mangallilaw detuy dePUTAda ta inbulsa na ti kaaduan nga porsyento tay Pork barrel na. What? In Pilar? Farm to market roads? Nia nga barangay ngata Apo. Be specific. I suppose you have to set your priorities. 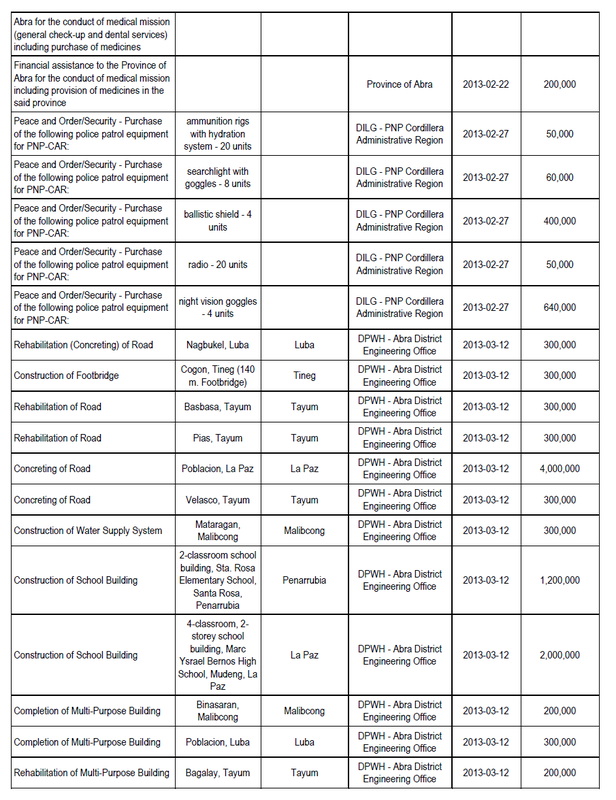 Saan pay laeng nasemento Amin nga national road diay Pilar. How come as per breakdown ket Adan farm to market road nga proyecto. Diay pay dalan nga mapan Pinsal Falls( Brgy. Nagcanasan) nu rainy season kakaasi nga magmagna maestro ken mamaestra ti kinalubo ti kalsada. Dagiti boulders ti bato akaraywara diay ting a ti kalsada. 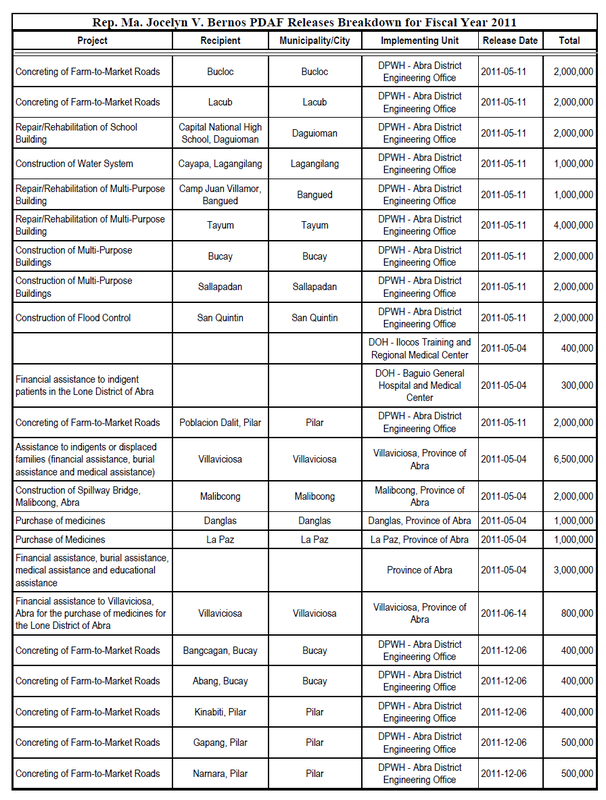 Baka mabalin Apo, check or posts pictures of where these projects are and when were these finished…. 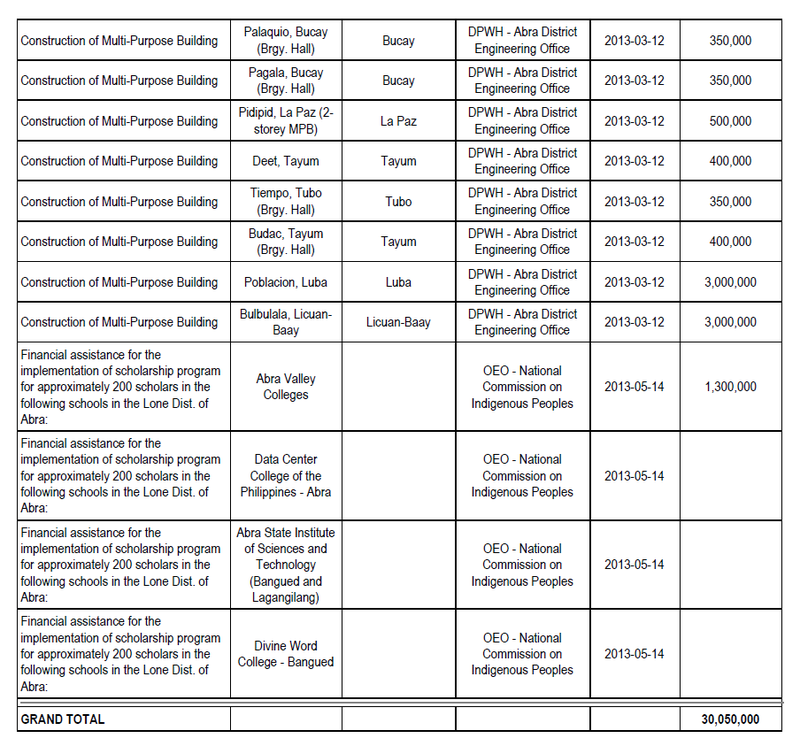 Pilar has the biggest RA 7171 share wiih more than 50 million pesos/ yr. Even without pork barrel of the congressman, ask your mayor where is your money? Dating bang mayaman ang mayor yan? Napunta yata sa mga big houses, luxury cars, vicio, investments, big time derby, yong pera ninyo. AGRIING KAYO DITAN, Agririgat kayo ngem agim-imas met ti biag ta mayor ken familyana. Adda matayo, ngem dikayo met usaren. Uray mamindua wenno mamintallo koma ti kaatiddag ti baranggay yo roads no nausar ti kuarta yo, class A koman ti sementado ti amin nga kalsadayo. Turturog pansitan kayo dita Pilar. Nasayaat laengen ta siaayat nga nangidanon ni Gov. Takit ti provincial road from Pidigan to Dalit? Before you ask the congresswoman, ask your mayor first? AYANNA RA 7171MAYOR. Kapatas la ti sueldo ti district supervisor ti eskwela ti Sweldo ni mayor yo. Ni apo supervisor, narigat pay makagatang ti maysa nga lugan, ni mayor yo, nangalaanna ti inggatangna ti logloganna, saan nga naggapu ti PDAF, IRA, RA7171. Pudno tay nakitak nga cartoon, drawing nga ti evolution ti maysa ngapolitiko ti Pilipinas ket naggapu nga songgo, nagbalin nga Tao, ket itan maysa nga baboy. AGPANUNOT KAYO DITAN, awan Serbi ti reklamoyo ta palob-osanyo met ti linoloko ta il iyo.